Every girl gets it. We all hate it. And it goes by the name of frizz. 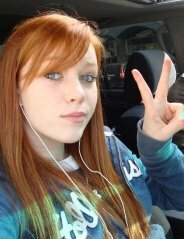 Lots of girls try using gels, sprays, shampoos, leave-in conditioners ... anything that may help. But the fact of the matter is they usually don't. It's the age-old question, and I'm here to answer it: "What can I do to stop my frizz?" Okay, ladies, think about when you're in the shower and you're using your shampoo that doesn't seem to help your frizz one bit. My mom has super frizzy curly thick hair, and I have straight, frizzy thin hair, but no matter your hair type I know a product that seems to always dull down the frizz. 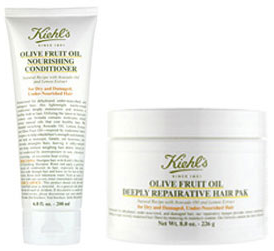 Khiel's olive fruit oil shampoo and conditioners are great. They give your hair its natural shine and body back without the frizz. Now you're washing your hair and you're scrubbing your head like a maniac, right? Wrong. Scrubbing the shampoo into your scalp can damage your roots and cause frizz. Instead you should take a hairbrush - yeah, that's right, any old brush - and brush the shampoo throughout your hair and lather. Now rinse. Easy, right? Cool. Okay, now conditioner. Do the same, except don't lather. Instead leave in for 3-5 minutes so your hair can soak it all up, then rinse. When you get out pat dry and try to avoid blow drying unless you have a blow dryer brush. Hope this helps you get rid of the frizz-bizz!